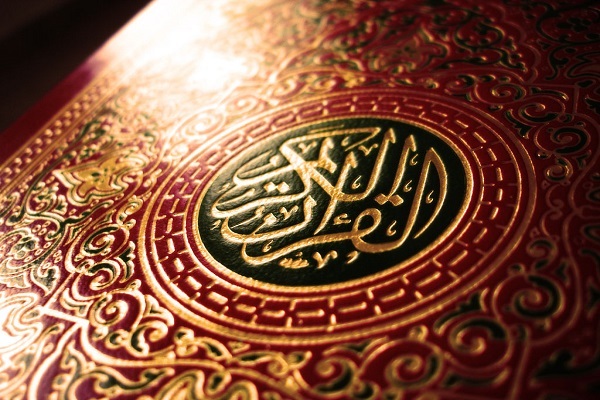 Should the Quran influence laws in Muslim countries? 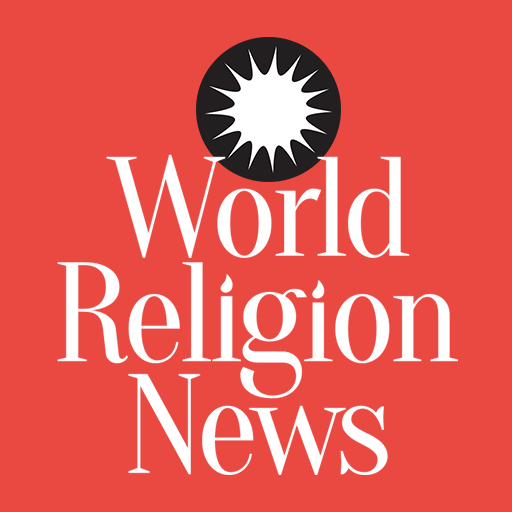 A survey by the Pew Research Center has revealed that there are prominent fissures in the Muslim world when it comes to establishing the relationship between government laws and Islamic tenets. The survey was done among citizens of ten countries having a significant Muslim population. The ten countries were Pakistan, Palestinian Territories, Jordan, Malaysia, Senegal, Nigeria, Indonesia, Lebanon, Turkey, and Burkina Faso. The highest percentage of population with the opinion that the laws of their countries should adhere to Quran teachings are Pakistani, Palestinian, Senegalese, Malaysian, and Jordanians. The study was done between April 5 and May 21, 2015. About 78 percent of Pakistanis believe the rule of theology. Coming in second is the Palestinian Territories with 65 percent. Population in the constitutional monarchy of Jordan are also in favor of laws following the Quran, with 54 percent warm to the idea. However, this number has lessened in Jordan during the last few years, with a percentage decline of 18 points from 2012. At the opposite end of the spectrum are Burkina Faso, Indonesia, Turkey and Lebanon. Less than 25 percent of the population in these countries are of the opinion that the Quran should have any impact on state laws. In many such countries where a large number of non-Muslim populations exist, strong disagreements can be observed between the bigger religious groups. To give an example, about 42 percent of those polled in Nigeria hold the opinion that laws must not be influenced by the Quran. However, when this poll is conducted only among Nigerian Muslims, it is found that 52 percent of respondents believe that Islamic law should show the road to justice to Nigerian state laws. 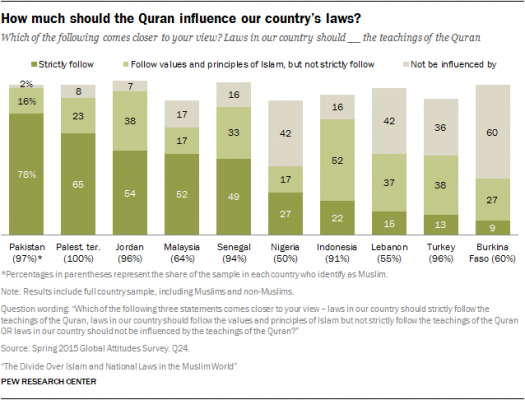 In Malaysia, 52 percent of those polled are in favor of laws based on the Quran’s teachings. Those polled were a mix of both Muslims and non-Muslims. 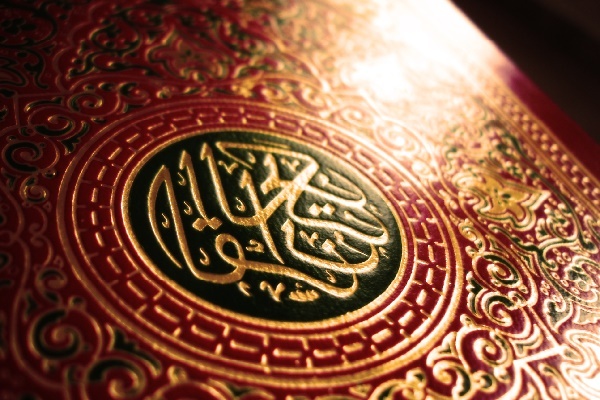 Among the Muslim Malays, an overwhelming 78 percent say law should strictly follow the Quran. In contrast, 38 percent of Malaysian Buddhists oppose Islamic laws and 37 percent have stayed neutral. In contrast to the rigidity of the above countries, people in Burkina Faso, Indonesia, Turkey, and Lebanon are much more secular. Approximately 75 percent of those polled hold the opinion that state laws should be kept separate from Quran or can be slightly influenced by it. In countries like Burkina Faso and Lebanon, the religious divide in their populations has contributed to this secular result.